Make no mistake, it is a war. The resumption of an ancient rivalry, hopefully signalled by the Springboks’ shock win in Wellington, was confirmed at Loftus Versveld in Pretoria on Saturday afternoon. 66-66 in points over two games, and ten tries to eight do not lie. The devil in South African rugby is back, and there is every sign it is here to stay. There was a primeval feeling in the air as Springbok supporters rose from their sky-blue seats – the debentures of the die blou bulle – and all but drowned out ‘Kapa O Pango’ just before kick-off. This was a true clash of rugby steel, of nation against nation, blood against blood. For an hour or so, it looked like South Africa could do the unthinkable, and achieve a seasonal double over the All Blacks, winning games back-to-back. Again their big men dominated, the Eben Etzebeths, Malcolm Marxes and Pieter-Steph du Toits so prized in this corner of the rugby world, held sway. The waves of sheer physicality felt irresistible. Under a real threat to their supremacy in the Rugby Championship, New Zealand did what they do best – staying blue head cool and finding a way to solve the puzzle in the one quarter of the game they could control. They achieved an unlikely comeback with the power of their bench and by shifting the pieces of their backline into a new shape which may well prove to be the pathway to the future, long term. In the 51st minute, Richie Mo’unga came on to the field to replace not Beauden Barrett – as might have been expected – but winger Waisake Naholo. This meant Barrett dropped to fullback and Ben Smith shifted over to the right wing, with Mo’unga playing the pivotal role at 10. It is the arrangement I first suggested in this article at the start of August. With the All Blacks under the pump and experiencing more pressure than at any time since the series against the British and Irish Lions back in 2017, the new backline came through with flying colours. Within one minute of Mo’unga’s arrival on the field, South Africa had extended their lead to 23-6 and the All Blacks had a big mountain to climb. Their ability to make the ascent was largely determined by a second monumental contribution in two weeks by Ardie Savea in the back row, and by the new structure at 10 and 15 behind him. Barrett sidesteps both of the main kick chasers, winger Aphiwe Dyantyi and Siya Kolisi, and the extra metres he makes on the return are critical to the success of the pickup by Codie Taylor afterwards. Kolisi is still trying to recover from his miss on Barrett, and is five metres behind the play when Taylor goes through the space (at shortside guard) that Kolisi would have been defending. In the first example, after taking the ball at fullback Barrett has the time to measure a superb 50-metre touch-finder, end over end, from a very narrow angle. In the second, he is playing at first receiver and the Bokke frontline defence is that much closer to him. The result is a clear win for South Africa, with Barrett lobbing the ball gently down Damian Willemse’s throat, and the latter’s electric feet do the rest on the return. When he receives the ball near the left sideline, all the cards are stacked in favour of the new Springboks wunderkind Aphiwe Dyantyi. He has the momentum to kick through into an empty backfield and runs past the starting New Zealand fullback, Ben Smith, as if he isn’t there at all. Despite having to stop, turn and spot the South African flyer a two- or three-metre start, Barrett gets back to overhaul him and prevent the try. It is a remarkable piece of defensive recovery work, and only Barrett could have done it. Damian McKenzie? Forget it. 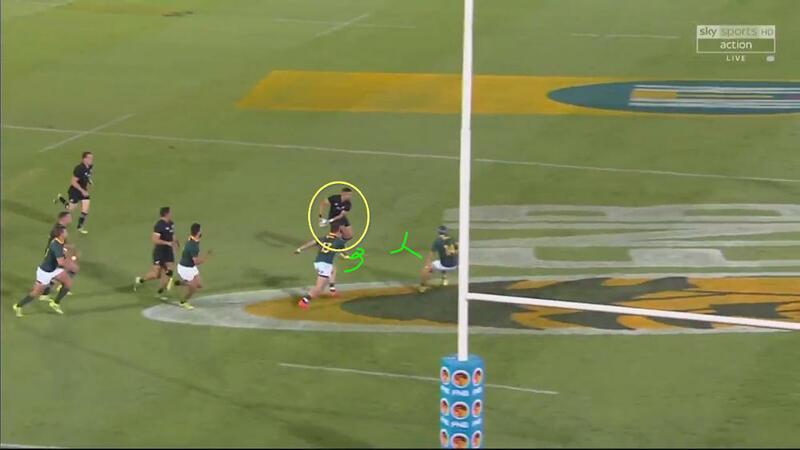 Barrett almost repeated the same trick to stop Cheslin Kolbe scoring in the 59th minute (at 2:55 on the reel). He gets off the line incredibly quickly to hit Kolbe before he reaches the goalline, but the referee and TMO between them awarded a score that was, I believe, never proven beyond reasonable doubt. In attack, the combination of Mo’unga and Barrett at second and third receiver worked smoothly to create a try for Rieko Ioane in the 62nd minute (at 4:00 on the reel). After Ryan Crotty swings the ball onto Mo’unga, the true value of the Crusaders number 10 to New Zealand’s attack is distilled in the face of the Springboks’ fierce rush defence. The All Blacks scrum is being shunted and they have lost the battle on the loosehead side of the set-piece, but Mo’unga rescues the situation with the angle of his run right on the gain-line. It takes him past the inside shoulder of Handre Pollard and through Embrose Papier and restores the advantage in favour of the offence. There is a lot to like about Richie Mo’unga’s blue-collar work ethic too. There is little of the prima donna in him. Mo’unga knows his own limitations and after Marx gets to the tackle first, he peels him away with a perfectly executed roll cleanout to the side. He gets my vote just because of that one play! We can see only the back of Ardie Savea’s curly mop, but it is Richie Mo’unga who has driven the All Blacks forward into the game-winning position which had seemed so unlikely only 20 minutes before. South Africa are back, there can be no doubt about it. The physicality of their big men up front and their tactical control in the halves were the dominant features which ‘won’ the first hour of the match and helped them to what should have been a winning 17-point lead. But New Zealand won the last quarter – and it was those last 20-25 minutes that mattered the most. It was no coincidence that the All Blacks’ reorganised backline was on the field during that period of game. With Richie Mo’unga at 10, Beauden Barrett dropping to fullback and Ben Smith on the right wing, the All Blacks were at their most cohesive in the backs, both with and without the ball. Mo’unga has now shown that he can be effective at Test level in one of the most hostile rugby environments in the world. He has also shown a glimpse of the future – and that future is not Barrett and McKenzie, it is Mo’unga and Barrett. 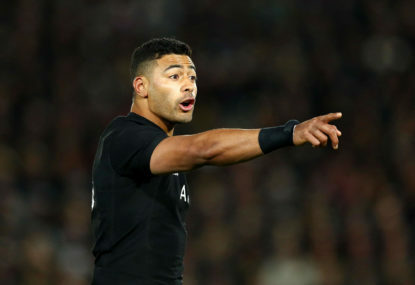 Steve Hansen and his coaches have broken the mould by selecting Mo’unga ahead of Damian McKenzie on the bench. With the European tour to come, and two momentous matches on successive weekends against England and Ireland on the horizon, will they go one step further and make Richie the main man right from the start?